As much as I enjoy eating ice cream, I also get a kick out of learning how the ice cream industry fits together. When Snickers ice cream entered the market in 2010, I was confused as to who was producing Mars branded ice cream. Well, the answer is Mars is making Mars branded ice cream. Apparently, way back in 1986 Mars bought Dove from the Stefanos family. They moved production a facility is in Burr Ridge, a suburb of Chicago, and have been there ever since. I have found memories of the Snickers Ice Cream Bar, they were first made in 1991. Cones and Sticks were added in 2000. All North American novelties are made in Burr Ridge (pints are made by another company in another location). "That's all great Dubba, but why should I care?" "Ummm, Dubba, haven't they done that before?" Ok, technically, there use to be the teeny tiny "Minis Mix" which included ice cream versions of Snickers, Milky Way, 3 Musketeers, and Twix (my newer review here). The problem was they were 90 calories a piece which meant they were about 0.0034918 inches long and not terribly filling. 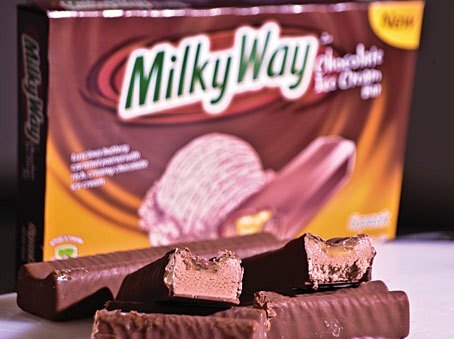 Actually, you can still buy the mini milky way ice cream bars. 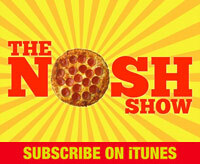 The new full size bars will be out starting March 2012. Despite barely remembering the old version, I'm kinda psyched for the new version. Anyway, if you want to read more about Dairy Food's visit to Mars production facility, there are two lengthy articles to catch up on. Candy bars to ice cream bars: How Mars makes the transition and also Watching Mars make Dove bars, Snickers ice cream cones.